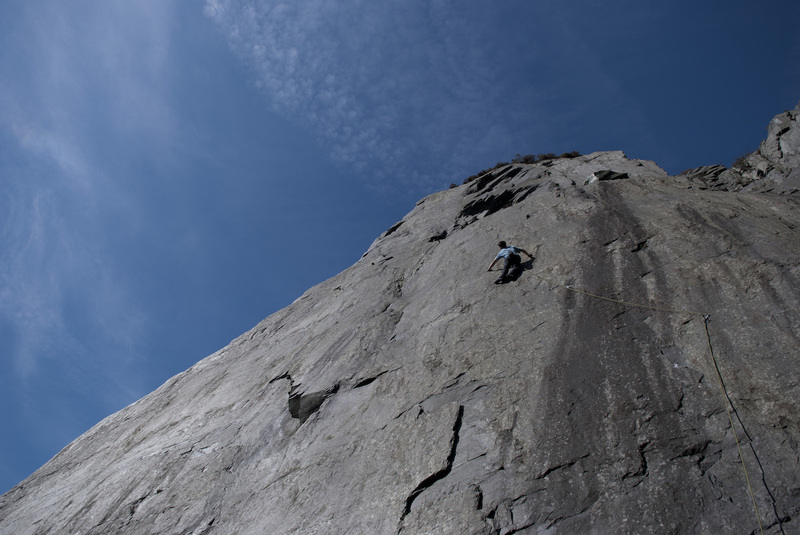 This area is popular and has some classic slate frighteners and some modern sport climbs. There has been a massive rock fall in the Shame and embarrassment area, all routes between bar of soap and stairlift to heaven are affected, and possibly some eastern european new routes to be had. ‘Machine in the Ghost’ seems harsh compared to other slate routes of the same grade. Harder and bolder than Scheherezade. A few route remain to be re-equipped. Dark and Scary Stories E5 6bA good direct variant of Kubla Khan, low in the grade. Climb Kubla Khan up to the bolt, sprint up the slab via some bold climbing to reach the third bolt of ‘Short Stories’, finish as for that route. Home Run E2 5c*. New bolts. belay is already eco anchors. Two bolts added on to top and one above the first bolt. Difficult moves to first lead to a precarious one to reach the second. Ok to top from then. Patellaectomy E1***. New belay, bolt as already stainless and good. 03/07. Climb the left-hand rampline, via a difficult start, to just below the niche. Climb the wall left of the niche to join One Hundred Words above. Finish up the challenging headwall. A little easier than One Hundred Words..
* The first bolt is too low and the moves are sketchy – I recommend stick-clipping the 2nd until l get back there to replace the first bolt. The initial diagonal seam manages to be both a bit tenuous and a bit strenuous with excllent climbing up to a breather in the niche. A drilled pocket above the niche gives access, via hard-to-spot footholds and a reach, to the upper wall where torques, steinpulls, a dyno and some footless matching lead to a couple of very thin moves rightwards. A cruxy move up with tricky feet gains a pocket and the upper crack, which is followed with interest to the lower-off. Powerful and reachy climbing utilizing the shallow flake system above the tunnel entrance, with a couple of exciting ‘designer danger’ run outs. Figure-four the right hand shot hole to start, and straight away move into a series of very tenuous and powerful locks up the flake system until an all-out launch leftwards leaves you pondering the drop. Another powerful lock up leads to a move back right, the last bolt, and a lonely lead to the chains. Tunnel start – two meters inside the tunnel on the left there is a small foot ledge and a drilled side pull, start here then lock off and swing over the roof on a large thread hole. Side pulls and steinpulls take you out off the tunnel to the lower seeping shot-hole. A good sustained route with fun moves and a crux near the top, though maybe not the easy warm-up route its builders intended it to be. The route is on the back wall, just right of the tunnel. Start next to the boulder – there may be a Quarryman’s clip-stick in place for the first bolt. Monopoints and jug-handle tools pretty much mandatory, or take the M10 tick for a ‘Vertiges with homemade leashes and dual-point crampons’ ascent. Route created by Owen Samuel & Rocio Siemens. F.A. Pete Harrison 19/02/09. Start as for Pail Rider at the 4 shot holes at the base of the wall. Use these ( Don’t delve too deep as they’re full of water at the back! ) to gain the right hand flake and follow this to a small ledge and the third bolt. Step precariously left to the first shot hole under the bars. Keep going up the wall to the good edge on Patellaectomy and rock over to grab the right hand bar,(a short sling handy for protection) mantle this and head diagonally right to another bolt. Thin moves lead out to the last bolt near the arete, joining Pail Rider for its final moves and lower off. An enjoyable and airy pitch. F.A Andy Scott, Jon Ratcliffe 25/06/08. Start at the 4 shot holes at the base of the wall and follow the flakes out past three bolts. Thin sidepulls, tasty footwork and a long stride out right to gain the flake out near the arete with a small ledge and bolt. Up the short crack to an awkward mantel onto the ledge below the final arete. Reach out left to clip the last bolt and pull onto the wall and arete with a fierce little pull for the lower off. F.A Andy Scott, Jon Ratcliffe 24/06/08. Starts a couple of metres right of the previous route. Climb the pleasantly delicate shallow groove to a niche, pull into and up this to the base of a short crack on the left and a junction with the previous route. Continue following the ‘Pail Rider’ to it’s lower off, the crux being exactly that. OFFA`S F6b 15m NEW ROUTE. First line on the right as you enter the bay, up the middle of the steep wall, five bolts to a chain lower off lead the way. Nice climbing, the crux being in the middle, past the overlap, allthough fairly steady all the way. F.A. Chris Davies, Mark Williams. 08/05/10. Hawkeye F5c* – New route on extreme left of area behind ventilation tower. 6 Bolts to a new 2 bolt lower off. Reachy! F. A I Lloyd Jones and Colin Goodey. Fresh Air F6a**-New route taking a direct line between Hot air crack and Breaking Wind- This route is close to the old route Breaking Wind, either way it is good and colin had spoken to the FA who was more than happy to have his route retro bolted. State of the Heart F6c+ ** New route behind hot air shaft. Use long quick draws, move right above last bolt. FA Mike Raine 22.03.08 in snow showers! Yossarian F6b New route. Climbs the overlapping slab between the two obvious aretes. 7 bolts to a double bolt lower off. Move right to pass 3rd bolt on layaways. FA P.A.Targett I.LLoyd-Jones 29.05.08. Start as for tomb raider, after second bolt, go up and left following a line of three more bolts, to a double bolt lower off . really good climbing , tricky move by the third bolt, exciting moves to the lower off ! Start : To the left of the impressive main slab lies a huge complex wall (‘Tombs Wall’-my name!) rising over 100ft This route starts below the middle of the wall at a short concrete coated slab. Traverse right along Dandelion ledge to gain another airy perch on the far arete-bolt belays. Climb directly up the corner to below the roof (2bolts).Either climb directly over the roof 6a+ or move out left and up(bolt) to rejoin the corner 6a .Continue delightfully up the corner crack (3bolts) to a good stance and bolt belays. A super 2 pitch sport route.The name of this route is the number of quarrymen who died while working the Dinorwic Quarry. Before climbing in this awesome historical place, remember its past and the people involved in creating our playground. The route starts on the left hand side of Never Never Land Slab, between ‘Rodent to Nowhere’ and ‘Scheherezade’, on the arête. 1, 16m, 5b: A tricky start leads to easier climbing following the line of bolts up the arête to a sloping ledge with double bolt lower off. 2, 7m, 5c: Step up the steep wall behind the belay to a good ledge, rest and make a powerful move up to gain better holds on the small arête, then mantle onto the belay ledge as for ‘Tomb Raider’ pitch 2 (lower-offs to follow). Starts 30m to the right of the entrance to the amphitheatre(turdongorge!!) A hidden facet of slab gives access to the steep wall above(2bolts) This 20′ slab ends on an edge below the Gargoyl (bolt) which forms the crux-difficult balance moves allow the gargoyl to be surmounted followed by more awkward moves past 2bolts leading to easier climbing to a double bolt lower off.-15m. FA: Kath Goodey,Colin Goodey,Del Smith.14th August 2008.
loose rock (in spite of cleaning) may be found but will diminish with traffic. Start near right edge of the ‘blocky’ buttress. After a rockover to the left the route moves to the right edge and climbs steeply up past 7 bolts to a double chain lower off. FA :Colin Goodey & Mark Hellewell & Sue Trainer 23rd July 2010. Another brilliant addition to this unlikely and neglected area. The route follows a line between Carbon stage and Titan and follows steep blocky bulges to a small shelf below a mantle (ok if your 6ft or near otherwise a dyno!). 6 bolts lead to the shared chain of Titan. FA: Mark Hellewell &Colin Goodey 25th July 2010. It is my endeavour to develope this bay as an alternative to Dali’s and these two routes form the opening gambit. The idea being to produce easy accessable, enjoyable easyto mid grade sport routes for all to enjoy. Four more routes in the lower grades are mapped out here. Before the drill went cold-two foreign climbers rushed up these climbs and loved them-a sign of things to come I hope! New route situated beyond Zeus and Titan etc at the head of the gorge. Starting off the scree slope: A tricky mantelshelf to the right of the first bolt provides the crux of this route. After reaching right to clip the second bolt you gain a good sized ledge from where you can climb the right hand side of the obvious slab above at a more amenable grade. The next two new routes weave their way up the buttress/Arete situated between Andy Pandy and Release The Kraken. Some loose rock. Always a good idea for the second to wear a helmet. Just to the left of Release The Kraken, this route zig zags up the arete. 7 bolts to double Lower-off. F.A: Graham Sutton and Mark Hellewell. 17th Sept 2013. Dog and Bone. f6a. 20m. Starts with delicate moves up clean rock right of Andy Pandy and weaves it’s way up the left hand side of the buttress. 7 bolts to double lower-off. New 2 pitch sport route taking an impressive line up a hitherto unclimbed wall-excellent quality route,rock and situation. (Giant boulder area-my name!) start in a hidden bay behind these huge blocs..
L1 17m F6b :Make hard moves to gain a mantleshelf followed by harder moves to gain a sloping shelf(the original layback flake became loose and was removed) crux F6b.Continue up the corner to the foot of a steep slab which leads to a good ledge with bolt belays.7bolts protect. the steep ‘flying arete’.Climb this in fine position to an impressive mantelshelf finish which leads to a double bolt belay/lower off.-6 bolts and a peg protect. A very fine pitch. NB : The top anchors have been placed to allow the route to be done in one pitch using a 60m sport rope.